CPM Student TutorialsCPM eBook SupportStudent: CPM eBooks (Student Version) Trouble ShootingHow Do I Refresh my Browser Window or Empty My Cache? 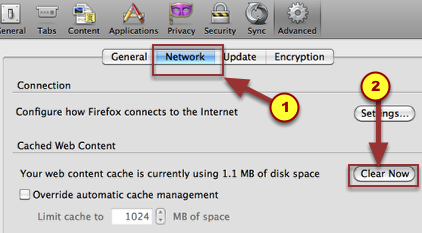 This tutorial describes how to refresh your browser window and empty your cache from Firefox, Safari, and Google Chrome. Scroll down to the appropriate section for emptying the cache. 1. To refresh your browser window, click on the backwards arrow usually found at the right or left of your URL. 2. EMPTY FIREFOX CACHE: Go to the top menu and click on &apos;Firefox&apos; and then &apos;Preferences&apos;. 3. Choose the &apos;Network&apos; tab and then click on &apos;Clear Now&apos;. 4. 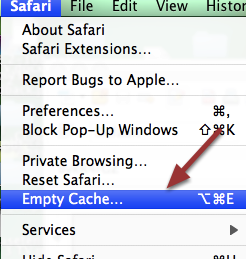 EMPTY SAFARI CACHE: Go to the top menu and click on &apos;Safari&apos; and then &apos;Empty Cache&apos;. 5. A popup menu will appear. Click &apos;Empty&apos;. 6. EMPTY CHROME CACHE: Go to the top menu and click on &apos;Chrome&apos; and then &apos;Clear Browsing Data&apos;. 7. A popup menu will appear. Choose the time period. 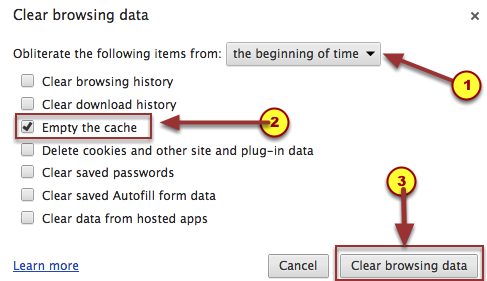 Click the checkbox &apos;Empty the cache&apos;. 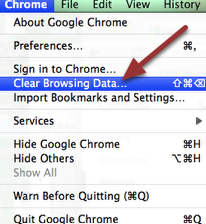 Then click the button "Clear browsing data&apos;. Next: How do I get the PDF Resource Pages to print to scale?